All the right things...without beauty? ACA is one of just a few small classical Christian schools in Denver, founded to be a competitive academic academy focused on teaching truth and modeling virtue, for God's glory and the good of all people. This mission has flourished in our first eight years. What is our outlook for the years ahead? Growth. 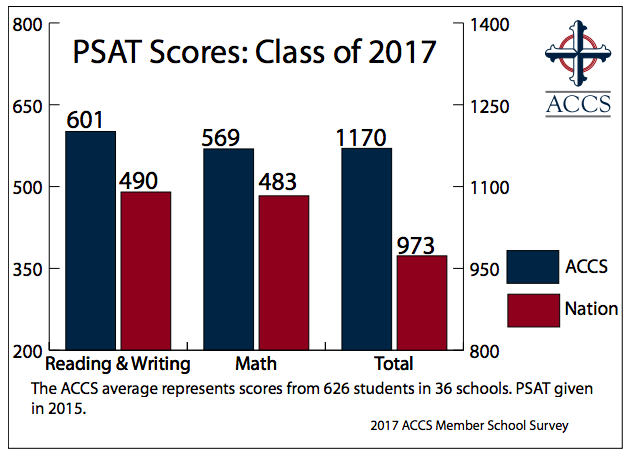 ACA's 2018-19 enrollment is 120 students, with approximately 40 students in our ACP programs and 80 students in K-12. Overall growth year-over-year is important to us, as the more students are enrolled, the more quality we can invest in our programs, the more aid we can extend to families in need, and the more students we can impact from diverse backgrounds. However, one of our most important growth goals is to retain our low 16:1 student-teacher ratio regardless of future size. That's a sweet spot for quality learning. Location. ACA's long-term plan is to remain in Lakewood for our main campus. We've successfully put down roots here while still attracting families from diverse locations around the greater Denver area. In 2020, our Lakewood-Belmar lease is due for renewal, and we plan to remain on site for the next few years, during which time we'll explore other possible venues in the nearby area as we out-grow this building space. Additionally, our preschool branch in Edgewater is in a valuable position for families in the West Denver area, and we are in the process of renewing our lease there for the next few years. Overall, our long-term vision is owning a larger permanent location with widespread influence in the Lakewood community, and a continued long-term preschool presence in the West Denver area. Content. ACA's curriculum is designed to be classical, Christian, and traditional. You can peruse preschool philosophy here, K-6 curriculum maps here and 7th-12th (upper school) detailed scope here. All core knowledge areas of standard public education are taught at ACA, but our teaching methodology, learning standards, and worldview are fundamentally different. This allows ACA to remain relevant in the 21st century in terms of practical training, preparation, and ability to grapple with current issues, but it sets ACA apart by emphasizing time-tested learning skills, independent thinking (particularly in later years), clear communication, and moral standards rooted in the objective truth of the gospel. Relative to their public school peers nationally, this creates better college readiness, marketability, and cultural engagement for God's glory. Thank you for your faithful partnership with ACA. God has been good to us and blessed us, and I am fully confident that he will continue to do so -- for his glory, for the good of our students, and to spread his truth throughout the world. Christian School. Augustine Classical Academy is ﬁrst a Christian School. We teach and uphold our statement of faith and traditional Christian morality. We believe the Holy Scriptures are the divinely inspired word of God. ACA warmly welcomes families of other faiths but asks that all families respect its distinctive Christian identity. In all instruction we are respectful of other faiths while humbly maintaining the truths of our Christian faith. Classical School. Augustine Classical Academy is a Classical School. One of the most valuable developments of western civilization, classical education utilizes traditional liberal arts as a means of instilling wisdom and virtue in our students. Our liberal arts curriculum is delivered by way of the “Trivium,” a word that describes three modes of learning: grammar, logic, and rhetoric. Grammar is concerned with the basic facts, rules and required skills of any given subject. Logic involves learning to think and reason in the language of various subjects. Rhetoric requires students to express their thoughts in a compelling and persuasive manner. Classical education is fundamentally about the cultivation of wisdom and virtue. It employs a time-tested approach to provide students with the tools for a lifetime of learning. High academic standards allow students to rise to their God-given potential. Our vision reaches beyond teaching children what to think; we also teach them how to think. In the tradition of western civilization, education and classical education have always been synonymous. Classical education can be distinguished from modern education, in that it does not neglect the important ﬁrst step of giving students the tools for both intellectual development and for understanding their western, Christian heritage. Traditional School. Augustine Classical Academy is a traditional school. Although schools have tried many experimental innovations, few have been able to duplicate the success of the traditional classroom. In a traditional classroom, a knowledgeable, enthusiastic teacher carefully leads students into an understanding of each subject. Classrooms are quiet, orderly, and disciplined. Lessons are incremental, content is age appropriate, and students learn the important skill of quality written work completed in a timely manner. Homework is moderate and is for the purpose of practicing and preparing for a lesson. The traditional classroom is consistent with human nature, and the experience of many centuries has demonstrated its superior quality to the modern child-centered classroom. I reminded the students that it can be tricky business taking a single verse out of the Bible and plastering it on your shoes, mugs, and social media accounts. It is important to understand the context of the verse, particularly who wrote it, to whom it was written, and what was the author’s current locale/circumstance. Paul, awaiting martyrdom in a Roman prison, penned these words, not after winning the big football game or securing a lucrative TV contract for his ministry. Paul wasn’t focused on achievement but contentment. Our culture today holds up many idols, two of which are achievement and comfort. Only with Jesus do we have access to His supernatural power of contentment and the capacity to endure all things. Contentment and endurance are the antithesis to the idols of achievement and comfort. One student asked, is it wrong then to quote this verse after a victory or is it wrong for Steph Curry to have this verse embossed on his shoes? Good question! I replied no, and in all things what God is concerned about is our heart and our motivation. Can we still proclaim this verse after a loss? Yes, because through Jesus we can endure all things. Inspired by 'With God Daily Devotional' by Skye Jethani. ACA's mission is to partner with parents in guiding their kids' growth from age 3 to 18. Our daughters and sons at all stages of life desire guidance, and a general meeting of the minds between school and home is key. How, when, and how much guidance we give them varies with their age, but guidance should never be completely shut off. If it is (or if we have a track record of giving it badly), our kids will go elsewhere for guidance. They'll look for it somewhere, one way or the other. Preschoolers need guidance for everything all the time, like pulling up their pants and not running into the table with their head. Post-college adults in the work force need it far less often but in deeper ways, such as how to apply what they know to the specific challenges they are facing. What are some key ways we can guide our own children at home, in partnership with ACA, at their unique stages of growth? Look over their projects and drawings from school enthusiastically. Point out specific things they did well. Read books aloud daily. Engage them by asking them to observe or find items in each picture. For books you've read a lot, play a game by pausing mid-sentence to see if they can complete the sentence themselves from memory. Sing songs with them. This is weird for us 21st-century people, but little kids are crazy about singing, and it's one of the most effective ways for them to learn anything. If singing is out of the question for you, check out audio resources like Wee Sing or Pete Seeger's stories and songs for kids. Draw with them, or do crafts together. Both working parents can jump in on this for a few minutes each week, and the kids will love building relationships and fine motor skills alongside you. Set boundaries, have routines, and stick with them. Children crave order and predictability as a means of creativity and growth. Be physical. Early childhood till kindergarten is one of the most formative phases of a child's growth, and they need an overload of hugs and cuddles on a daily basis. From dads, too. Oversee their homework each night. What do they need to do? Have they done it? Don't give them too much independence too soon. They will forget things, cut corners, and not understand everything -- totally normal for this age. A little regular guidance (while you're making dinner, watching the news, or catching up on the budget) goes a long way. They can't do it alone. Keep them accountable. Make them quickly correct bad penmanship. Skim their math worksheet and circle problems they missed and need to do over again. You shouldn't hold their hand and feed them answers, but left completely to their own devices, their quality of work will degenerate over time. Set a standard for excellence, and invest them with a vision for its possibilities. Make regular deposits in their emotional bank. Make a point of finding several things to praise about their homework or learning over the dinner table. They'll feed off your emotional energy -- so when you give off an aroma of excitement about their learning every day, they'll have more energy to do more. Challenge them with simple but meaningful chores at home. Give them goals, track those goals, and reward them for completion. Kids in the elementary years are already yearning for respect, and they want to be authentically helpful, not just treated like dumb kids. Laugh with them a lot. This might sound silly, but they need it to cope with the increasing stress of school and of growing up. You also need it, because they aren't so cuddly and cute any more, but they still need just as much physical affection and love as before. Deepen the feel-good part of your relationship with them. Continue to guide your kids with consistent task follow-through. As the fog of puberty hits (especially with boys), all the things you thought they had down cold somehow disappear down the memory hole. Consistency is key, and this does not mean you aren't preparing them for independence -- the precise opposite. Clean, rigorous standards of excellence are the very means by which strong, independent adults are made. But now your guiding them primarily via respect and not physical enforcement. Talk regularly about school with them. Even if you can't help them with their pre-calculus homework, they still know you're interested and emotionally engaged with them. You're aware. Guide them with the knowledge and wisdom they crave, suffused with love, respect, and encouragement. Guide them toward college and career awareness. What are they passionate about? What do they do well? (They might not be the same thing.) Excite them early with the opportunities that universities offer, the hard work it takes to get there, and the rewards they'll reap through God's calling on their lives afterwards. Strengthen and solidify their sense of identity and purpose. They are children of God, chosen for a purpose, with work to do for his kingdom. Coming of age, as happens in high school and college, is often a time of deep doubt, regardless of what came before. Stay physical, continue to overload them with love, and regularly claim the good promises of God to them on their behalf. A few weeks ago during chapel, this is the charge I gave to upper school students. What did I mean exactly? I told them that they are in charge of their rooms at home and their lockers and supplies at school. When they demonstrate the ability to take care of their rooms and their school supplies, they are showing that they are capable of being responsible for what has been given to them. They should think of their rooms/lockers/backpacks as their kingdoms - this is what has been entrusted to them and they rule over their little kingdoms. Naturally, they can be good or bad kings/queens. They can either show dominion over the chaos and establish rule and order or they can let the chaos take over and be controlled by their mess. I encouraged them to be faithful in the little things in which they have been entrusted. Someday, they might want to be responsible for more. Notice Herod’s progression of emotions: first he was troubled, then angry, and finally he resorted to violence and ordered the slaughter of children. Like Herod, we can easily find ourselves on the same path (without the capacity to order the murder of scores of children) when our plans are interrupted. Anger has the power to be so destructive that Jesus addresses it first in his Sermon on the Mount. Dallas Willard said that anger “is a feeling that seizes us in our body and immediately impels us toward interfering with, and possibly even harming, those who have thwarted our will and interfered with our life.” The first step in learning to control our anger is learning to be open to divine interruptions, which often come in the form of ordinary everyday annoyances. We should welcome God to interrupt and thwart our plans, and as a result we open ourselves up to experience his grace and love. Then, by God’s grace, we can release the anger we feel when we are interrupted by others. I have a confession. I love book lists. I love reading these lists, all of them in their varied forms: 100 Classics to Read Before You Die, Best Books to Read on the Beach, Top 25 Books for Teenagers -- and it goes on. That’s right -- I find great enjoyment in reading lists of book titles and scrutinizing what books were included and excluded. I even have several books filled with book lists. Recently, my favorite book lists have to do with books that make great read-alouds. At the beginning of the school year, teachers shared with you a list of books for you to read aloud with your children. All of the books on the list were recommended by Sarah Mackenzie, author of The Read Aloud Family: Making Meaningful and Lasting Connections with Your Kids (complete with lots of book lists). I read this book last spring, and I highly recommend it. Mackenzie also hosts a weekly podcast, "Read Aloud Revival," which I enjoy as the main topic is book lists. At the Rodriguez household, we have a basket of Christmas books that come out of storage right after Thanksgiving. Every year, I buy a few more (always-used!) Christmas books, wrap them, and Sam and Ellie get to open them each week in Advent. When selecting books for the Christmas book basket, I mainly focus on books that are best when read aloud and shared together. There is the occasional exception -- a book that is best read alone -- but my goal is a shared experience with my kids and books. This Christmas season, I want to encourage you to start a new tradition in your home of spending time reading aloud to your children. Listening to quality literature has numerous benefits, including increased vocabulary, exposure to literature at a higher reading level, hearing proper inflection and phrasing, and instilling a love of story in young hearts. Children who are independent readers still love being read to, even teenagers! It is like salve for the soul. And, the best part is that reading aloud to your children is a free way to create lasting memories as a family. What books are good fits for reading aloud? Books that are told simply, and told well. Books that use rich and well-crafted language. Books that pique listeners' curiosity and stimulate imagination. Much of the rhetoric stage of the trivium centers around awareness, independence, and identity. In the high school years, students are essentially adults -- adults by other cultural or historical standards at the very least. Differences of specific maturity levels aside, the rhetoric stage is populated by students who are no longer children; and it is crucial that they are not treated as children. A great teacher recognizes who each student is, not just what that student must learn. This is the gateway to engagement and learning, and it is a key goal for high school teachers. If a late teenager is treated the same way as a middle schooler, achieving learning objects will be like jamming a square peg into a round hole: it may produce results sometimes, but not smoothly or effectively. Engage with high school students in many of the same ways that we engage with other adults. While students are not our friends or peers, they still become respectable when we show them they are worthy of respect -- even if they are not immediately demonstrating respectable habits. Standards and conformity are still key, but we should win their hearts before we win the argument. High school students have thin skin, high levels of pride, and low levels of confidence. They need support and kindness through the difficult tasks they face. Tough love is still love. Students may be frustrated by a difficult standard or consequence, but they can still ultimately see that they are being loved through a consequence -- as long as that love and respect has been authentically built with them over time. Teaching or parenting high schoolers should prepare them for independence. If they do not feel empowered toward independence from teachers or parents, they will always find that empowerment elsewhere. Grades and college admissions are important, but a student's faith during college is essential. As teachers and parents, are we more focused on our kids' robust report cards, or on their robust understanding of, and submission to, the whole counsels of God for life? Above all, let's pray for ACA's older students, pray for our own kids, and thank God for his saving grace and plans for our good. In upper school grades (7-12), college preparedness becomes a front-and-center goal. For most students, the question is, "Are my class grades high enough to get me into my goal college?" For many parents, the question might be, "Is my school providing appropriate and competitive curricula to allow my student to compete for a good college?" In some cases, a bright student may unfortunately be attending a school with subpar class choices, crippling his or her college prospects. Fortunately, this is not the case for most standard classical Christian (ACCS) schools. In fact, it's the opposite. 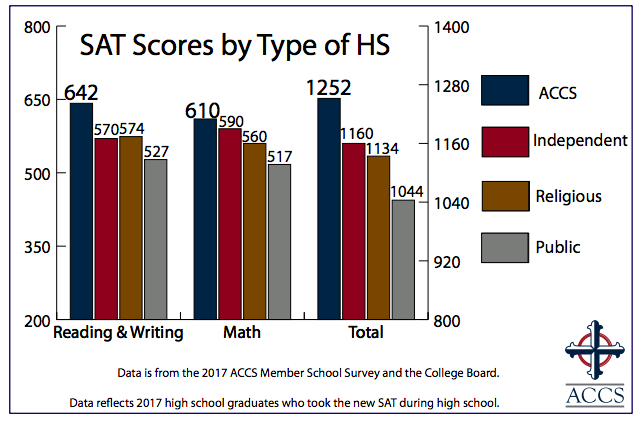 ACCS schools often have limited resources and funding, similar to ACA, and yet their college admissions and readiness scores consistently show high achievement relative to national norms. In other words, ACCS schools continue to demonstrate a strategic use of limited funding and a keen understanding of the essential elements of a primary education in its preparation for college and careers. For more information on similar college readiness benchmarks, you can explore related SAT and ACT rubrics here. 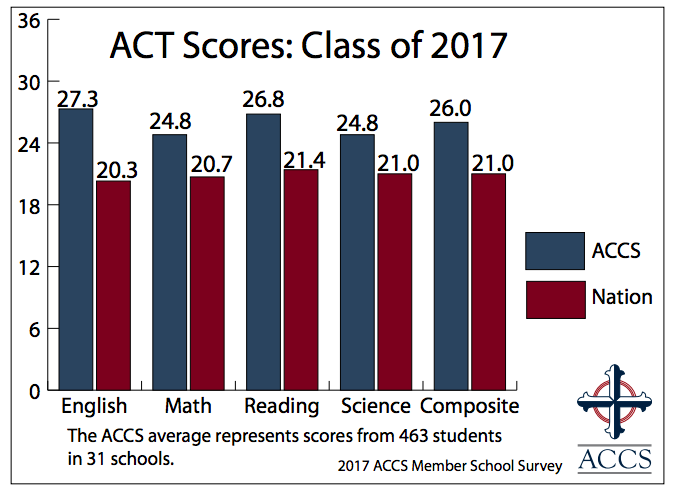 For the full 2017 ACCS Standardized Testing & College Admission survey, which ACA has submitted scores to for 2018, click here. In most schools, a key challenge for high school students is an increased amount of homework, often to the near-exclusion of meaningful free time. ACA, as a rigorous 4-day school, shares this challenge within its upper school. So an important question is: How can students learn to manage a high workload without detrimental effects? In 2007, the National Center for Education Statistics reported that, on average, US high school students spend 6.8 hours per week on homework, or about 82 minutes per night. For a 4-day school like ACA, not accounting for its accelerated academic standards, that equates to about 1 hour and 42 minutes per night. In ACA's Parent Handbook, our homework policy suggests (pp. 27-29) that 7th-8th grades should target 75 minutes of homework per night, and that 9th-12th graders should target 1.5 - 2.5 hours homework per night, goals that appropriately balance national 5-day averages with ACA's advanced 4-day program. But not all students have the same abilities, and not all assignments are created equal. This means that struggles with homework loads in upper school are still common. Given that reality, there are a few important ways to approach homework in advanced grades. Challenging homework prepares students for college-level work, and for the real world. Times of transition are difficult, and upper school begins preparations for adulthood. Students learn to manage decreased levels of rest and free time, as well as increased levels of work and responsibility. This is a challenge, but it is also a gift. Students are trained for independence and self-sufficiency. Homework should still never be more than is necessary. At ACA, we're keenly aware of the strategic strain our curriculum places on upper school students. Our design is to challenge them, but not to smother them. In assessing our degree of rigor, we look for general, long-term trends in student performance and well-being, and we are committed to limiting assignments to those that are essential for growth. Upper School students learn flexibility in habits. Ideal workloads never fall into the lap of every student generally. Rather, students must learn to strategize about ways to make their work more efficient. They consider questions such as, How can I make the most of every minute of the day? Are all my materials organized? Do I follow a consistent, inviolable homework routine every day of the year? Am I constantly challenging myself to greater speed and focus? Academic success is in large part a function of productivity, a non-academic metric. Investments into habits and structure pay dividends in terms of accuracy, speed, and retention. Upper school students balance long-term excellence with short-term growth adjustments. Sometimes, a short-term loss is a long-term win. If students are struggling with big reading loads or with getting math problem sets done, excellence is not always to dig in, go slower, and spend six hours per night working instead of two. Rather, students learn the appropriateness of setting occasional time limits on assignments. They might aim for total accuracy and speed, but they also bind themselves by the clock. This often results in lower short-term scores while efficiency is built, but over time, greater speed, efficiency, and accuracy are developed. Far from de-prioritizing ACA's standard of academic excellence, these strategies help students appropriately evolve their habits to the changing expectations they are given each year. Excellence, growth, flexibility, and preparation for independence -- these are a few of the wonderful features of ACA's unique upper school program. Our students work hard, but they are met with treasures at every turn (Ps. 16:11), gifts from a loving Father about his world that will prepare them for a life of service for his kingdom. Last week, we began a look at ACA's upper school program in grades 7-12, specifically focusing on themes and features via its curriculum. In future weeks, we'll take a look at college preparedness, emotional and developmental features of upper school students, homework loads, and sports and extracurriculars. Today, I'd like to focus on what the rhetoric stage is within upper school, and what it is not. Most uses of the word "rhetoric" today mean the opposite of what we're after -- today, rhetoric means verbal fluff, smoke, deception. But classical use revives the full historical meaning of the word: honest persuasion in the pursuit of truth. In this stage of upper school, students learn how to make what they say appealing. This aligns with their maturing developmental phase, which desires respect, recognition, and a clear identity as budding adults. Students are interested in making people believe them -- their friends, mentors, parents, or college admissions officers. This is a phase, but we want them to carry its outlook permanently, like God. "The words of the Lord are pure words: as silver tried in a furnace of earth, purified seven times" (Ps. 12:6). The rhetoric stage is the capstone of the trivium. It is the telos of all prior years of study since preschool, the goal, the crown and glory of classical education. Until this stage is reached, the grammar and logic stages are incomplete preparation -- valuable in their own right, but weakened and compromised without unification. As a goal, rhetoric is a queen with her crown, the picture of unity, strength, and power. But this is not just an impractical philosophical beauty. Upper school students still need to get into good colleges for God's glory. So the rhetoric stage is knowledge "coming out the fingertips" in terms of real hard work in math and science, Latin and public speaking, history and theology, art and music, writing and rhetoric. The beauty of the rhetoric stage is a practical beauty. Further, rhetoric fixes all knowledge to the standard of God's beauty, and it speaks like he speaks. It writes like he writes, creates like he creates, and loves like he loves. Unless that universal model of beauty is learned, what might happen to knowledge? Many things, from the silly to the tragic. Without beauty, brilliantly-educated minds give soporific speeches via monotone PowerPoint. Those that conceived the great cathedrals are gone, and "the architecture of servitude and boredom" (as Russell Kirk once said) produce industrial slums. The "suicide art" of Jackson Pollock and the "Piss Christ" of Andres Serrano are hailed as masterpieces. The ruling elite see the stunning magic of the infant human form as inventory to be chopped up and sold to the highest bidder. And if there is no beauty, no standard for loveliness, who are we to object? Let our children use their classically-educated minds to find their own truth. But the earth is full of God's glory, and it is crying unending praise to the Father, Son, and Holy Ghost. What is all our knowledge and logic without the living Word? What is beauty without the glory of Christ? What is love without incarnate Love? We lay all our learning at his feet -- from grammar to logic to rhetoric and beyond -- in recognition that he is the author and finisher of all.